Read Fest! 2017 is finally happening! But first, a foreword from the organising committee. 2017 marks the fourth year of Read! Fest, the National Library Board’s festival dedicated to introducing delectable offerings on the reading scene in Singapore. From author talks, panel discussions, workshops, and film screenings, Read! Fest 2017 is a celebration and interpretation of this year’s theme: Spice. Variety is the spice of life, and with that in mind, we will be delivering a wide range of programmes to whet your literary appetite. Come explore how the search for flavour influences the world. From its healing properties to adding intensity and fragrance, and as a much needed ingredient, this year is a gathering to rejoice in the significance of spices, both metaphorical and literal, in our lives. Over the next two months, there are more than 150 events to suit everyone’s palate. For starters, there are Mother Tongue language programmes: A Date with Yew Chin, a discussion on the Cultural Medallion recipient’s works, Gig Puisi, a gathering of the Malay literati, andMasala Payanam, a literary trail of short stories. Join us in Book Clubs to discuss Don’t Leave Home Without Your Chilli Sauce by Constance Singam and Sugarbread by Balli Kaur Jaswal, and find out which books are made in the kitchen. If you are curious about a librarian’s literary diet, check out their film selections paired with book recommendations. 2017 is also ASEAN’s 50th anniversary, and Read! Fest celebrates the literary wit, wisdom and wonder of ASEAN with an evening of stories by contemporary storytellers of Singapore. As we close Read! 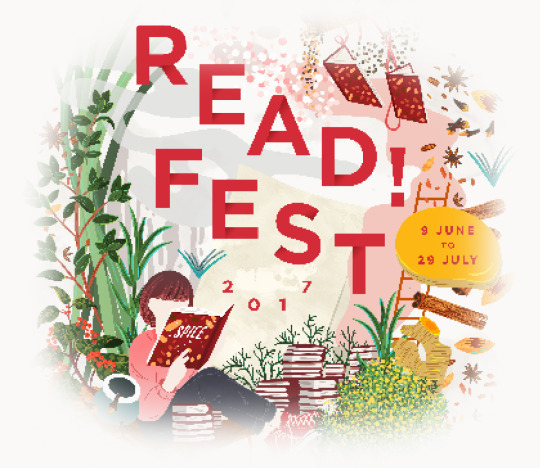 Fest 2017 with the National Reading Day on 29 July 2017, we invite you to spend some time with the written word. May the festival give zest and flavour to your reading journey. View or download the Read! Fest 2017 booklet below.